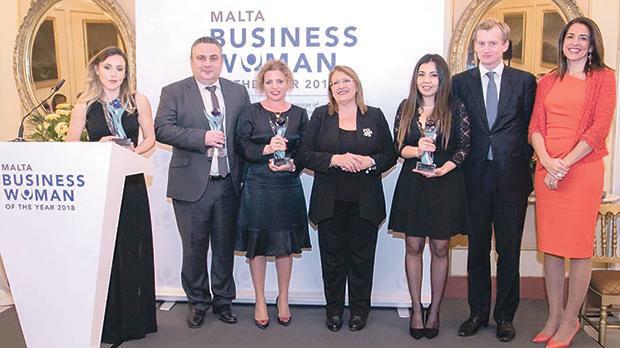 From left: Amanda Xuereb – winner of the Young Businesswoman Award; Edwin Borg, CEO Tigné Mall plc – Company Award for Excellence in the Promotion of Women; Natalie Briffa Farrugia – winner of the Malta Businesswoman of the Year 2018; President Marie-Louise Coleiro Preca; Ylenia Mifsud (on behalf of Isabella Mifsud) – Inspiring Role Model Award; Andrew Beane – CEO, HSBC Bank Malta plc; and Sonia Hernandez – chair of the judging panel. Natalie Briffa Farrugia is the winner of the first edition of the Malta Businesswoman of the Year Award, capping a remarkable journey – from teaching primary students, to tending to the vulnerable in Ethiopia and Guatemala, to leading one of Malta’s largest elderly home service providers, the Care Malta Group. Amanda Xuereb scooped up the Young Businesswoman Award during a ceremony that saw a line-up of inspirational business leaders and pioneers at Verdala Palace in Buskett to celebrate the spirit of female entrepreneurship. The Company Award for Excellence was presented to Tigné Mall plc for demonstrating a passion for inspiring, engaging, empowering and furthering the success of women within its company and in the community. The Malta Businesswoman of the Year Awards were launched last year through a partnership between HSBC Bank Malta plc and the Office of the President, with the aim of highlighting outstanding women leaders in the business and economic world. Dr Coleiro Preca, who is patron of the awards, conveyed her heartfelt congratulations to the winners and all the nominees of the Malta Businesswoman of the Year Awards and said that “through these awards, we are not only celebrating the achievements of these remarkable women, but also empowering our young women and girls to take up leadership roles across all strata of society”. Women-owned and run businesses are the fastest-growing economic segment in some countries, including the US; however, in Malta, the agenda to advance women’s entrepreneurship lacks momentum. In fact, 60 per cent of graduates from the University of Malta are female but only 8.5 per cent of all board positions in Malta’s listed companies are held by women – the lowest in the EU.